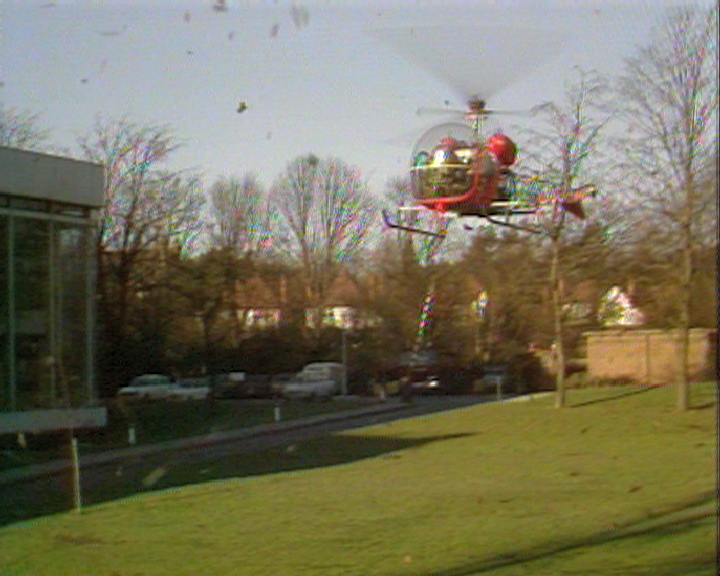 Still of a helicopter landing at Pebble Mill. This was probably during a Pebble Mill at One programme. A ‘Pebble Mill at One’ director has suggested that this still may be from the very last show, when Marian Foster arrived in a helicopter. Was it Noel Edmonds ? Good thought Marie – I wonder if anyone can remember what Noel’s helicopter looked like? None of which appear to be the same model as the one in the picture, but he could have borrowed it of course. I’ll see if I can identify the model and see if that helps.